Some artists are incredible performers, some artists are incredible musicians, and some artists are both. But every once in a while, there is that one artist (or group of artists) who seem to be a sort of jack-of-all-trades. 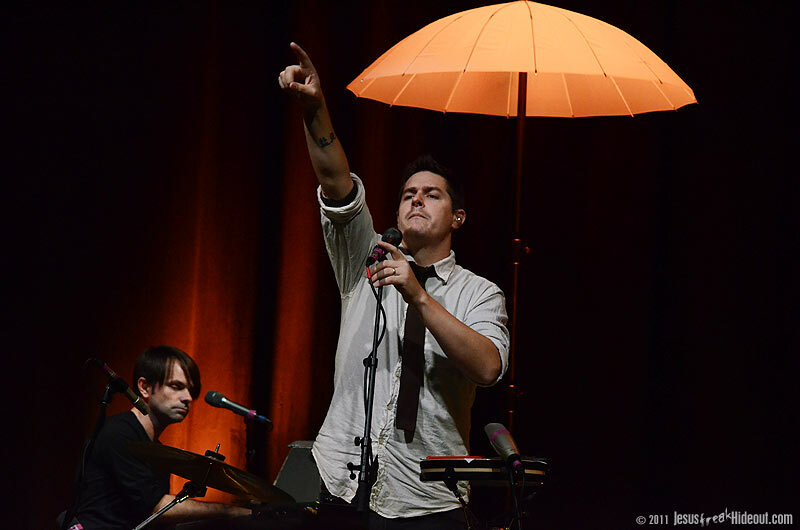 While Jars of Clay have proven to be quite the pop / pop rock giants, they've also proven the strength of their songs through many performances where they've stripped the production away to get to the heart of the song. When a band like Jars is plugged in and giving audiences an energetic pop rock show, it feels right for them, but there's also something especially impactful about their talent for turning things down and simplifying the presentation of their songs. 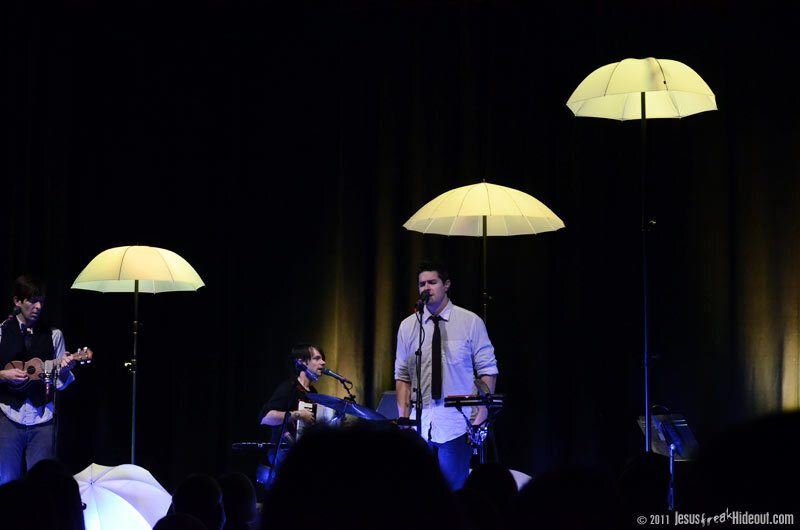 For their October 16th performance at Sellersville Theater 1894 in Sellersville, PA, the band performed an extensive acoustic set with two separate performances, all part of their fall 2011 Sing & Tell Tour. 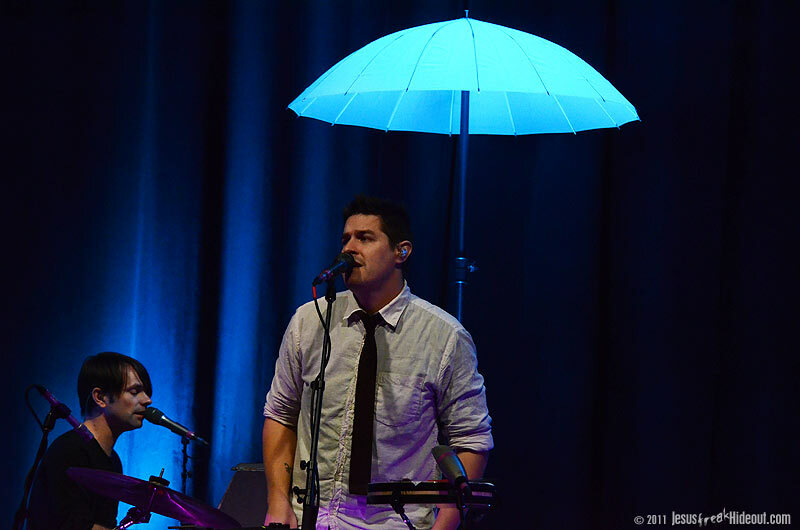 Fashioned to be a night of stories and songs, with the music presented acoustically, the band invited singer/songwriter Dave Barnes out on the road with them as tour support. Barnes has made a name for himself with this hit single "God Gave Me You," and his style and on-stage personality was a perfect match for Jars. With just a spotlight, mike and guitar, Barnes performed a short six-song set of originals. Opening with "Grace," Barnes followed the tune with his first story of the night, one about how his next song was often mistaken for a love song for his wife, but it was actually penned before he even met her. "On A Night Like This" was next, and then Barnes encouraged the audience to sing along for "What I Need," poking fun at the simplicity of the chorus at the same time. His charm easily reeled in the audience and his soulful voice only sealed the deal. "Little Lies" followed, with Barnes requesting some support from the crowd on the "la la-la-la la's." He then told a hilarious story about a day when a whole piece of fried chicken had dropped out of the sky onto the Barnes' back porch (they later discovered it'd been from a squirrel that had stolen it from a nearby church function). He then performed "Until You" and paused one last time to tell the story of his appearance on All My Children last summer to sing "God Gave Me You" live in an episode. It was a slightly embarassing story about how awkward the appearance was, but was still a real gem regardless. 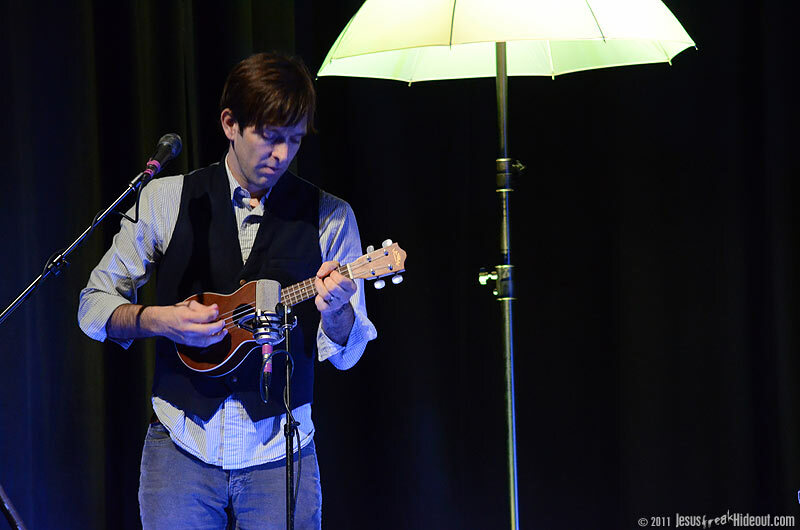 For his performance of the song this evening, he invited Jars of Clay's Steve Mason to accompany him on the ukulele, while Charlie Lowell sat in with the accordian. It was a great end to a fun opening set and a nice way to segue into the main event from Jars. 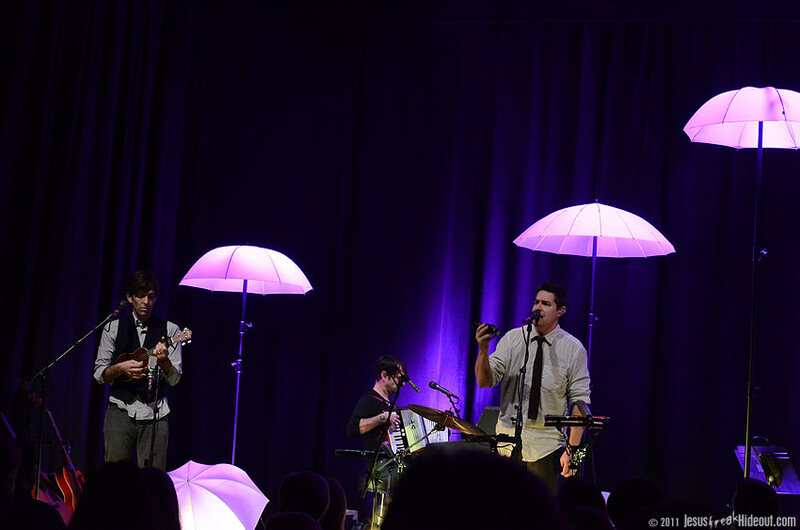 After a comfortable intermission, the Jars of Clay four, with cello support from Emily Nelson, emerged and began playing the opening track from their unforgettable self-titled debut album, "Liquid." 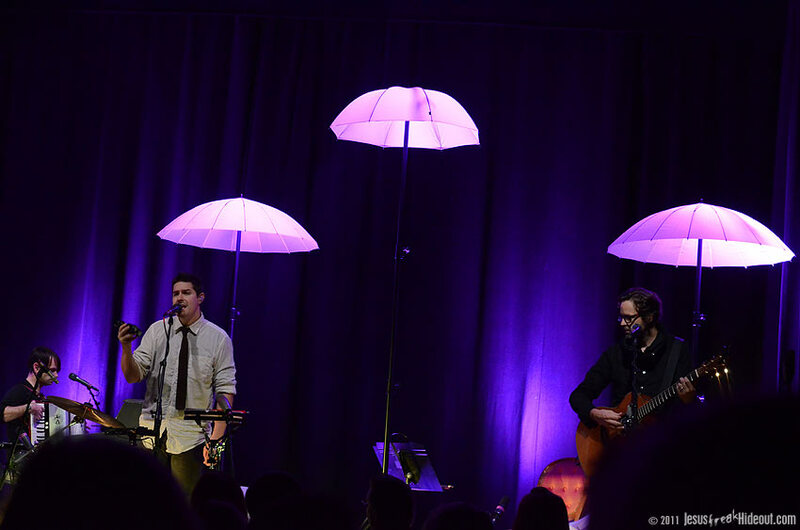 The stage was tastefully set up with various instruments, with the simple dressing of four standing umbrellas of varying sizes, and three umbrellas lying scattered on the stage floor. 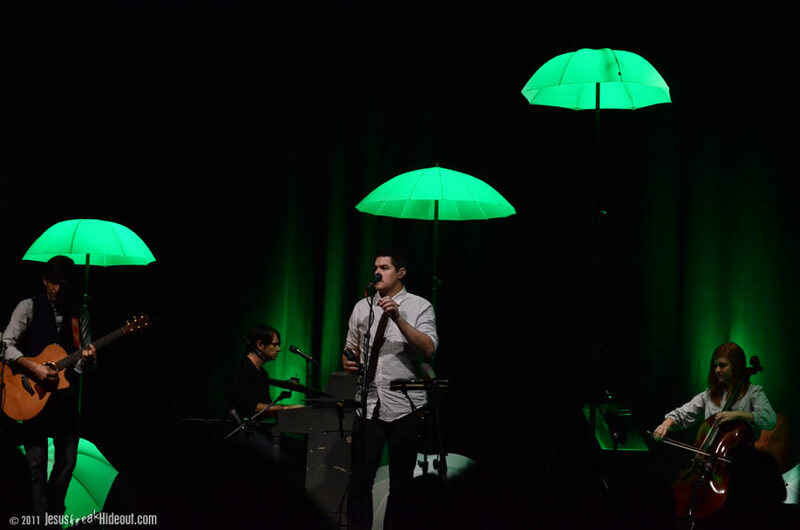 During the songs, the umbrellas would glow various colors; for some songs, they would appear green, others blue or fuchsia, and still others, red or white. It was a nice touch, especially as the color often mimicked the mood of the song or just simply gave the stage a different look. 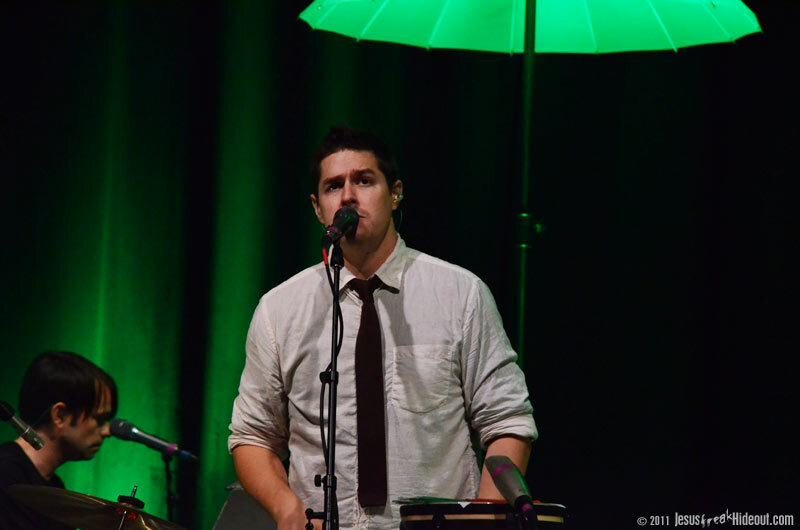 For their next song, an acoustic version of the rocker "Work," front man Dan Haseltine utilized a pair of drumstick brushes to hit a lone cymbal and a small snare, while also providing a basic bass beat with a foot pedal. It was a nice accent to many of the songs. The guys then dusted off "Something Beautiful," especially for this tour, from their album The Eleventh Hour, which was a wonderful follow-up to "Work." 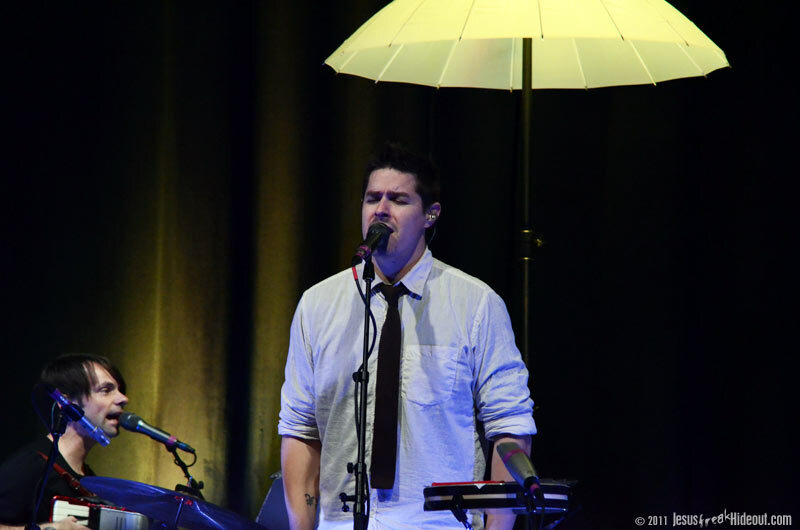 Haseltine took a moment then to talk about the next song; earlier this year on the Rock N Worship Road Show, the band had offered fans a pre-show acoustic set for which they could submit song requests online. One of those songs that had been requested was "River Constantine" from the band's third album, If I Left The Zoo. Most artists who have been around as long as Jars (with the exception of maybe Switchfoot) seem to find set lists that work really well and rarely deviate from a select 10 to 15 songs out of a huge catalog of music (And I do have you in mind, Newsboys). It's especially fun and exciting when Jars resurrects some songs that may have been long forgotten by some, but not their more devoted fans. It also gives newer listeners a chance to discover songs they may otherwise never hear. After "River Constantine," Haseltine introduced the next tune as a love song, and launched into an excellent acoustic version of "Closer," which sounded especially good with Mason and Lowell joining Haseltine with harmonizing vocals. 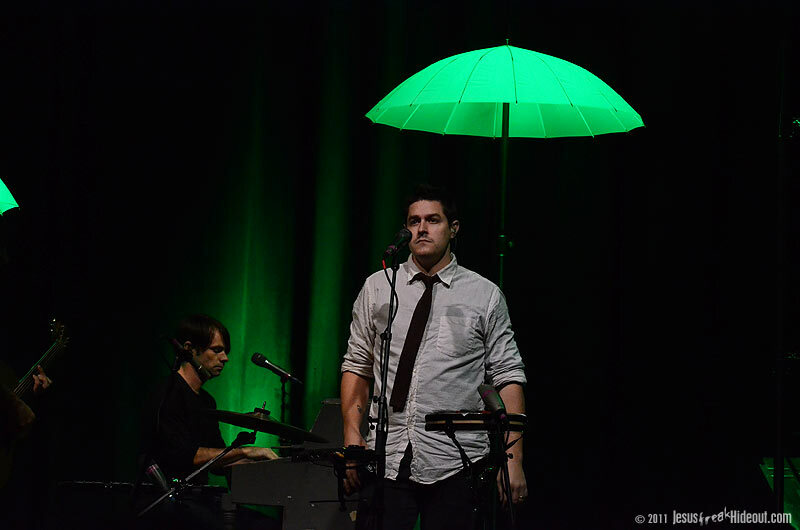 The emotional "Safe To Land" followed (which Dan said he likes to call "The fighting song") and then "Headphones" ended a three-song string of cuts from The Long Fall Back To Earth. Jars of Clay then visited The Shelter to perform "Eyes Wide Open," for which Haseltine provided some tambourine accompaniment. It was at this point that Nelson left the stage to leave just the core four to perform. The guys then told an amusing story about how the original version of "No One Loves Me Like You" had been prepped for Much Afraid but was eventually tossed out when it was discovered that the melody had much too closely resembled a Hoover vacuum cleaner commercial at the time! The song was then reworked for If I Left The Zoo and that was the version they performed next. They then broke out the title track from Much Afraid, which was certainly a song I hadn't heard live in quite some time, and then encouraged some audience participation to sing along with "I Need You." 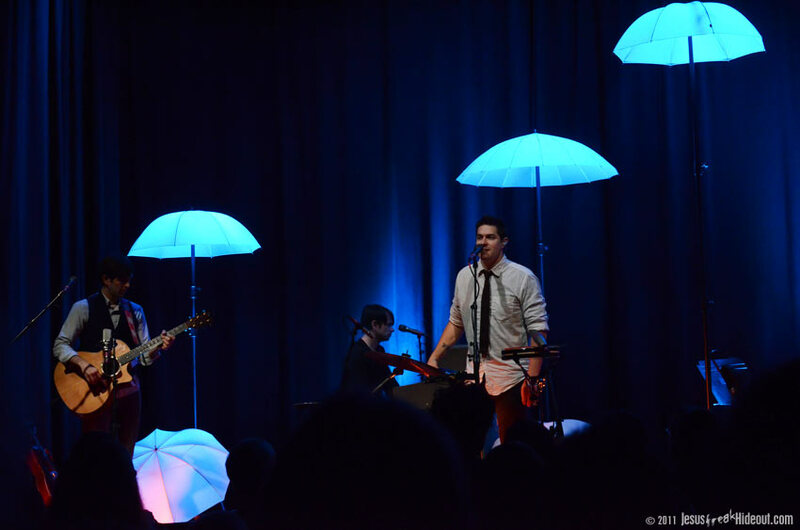 Haseltine shared another story from the Rock N Worship Road Show Tour about how some of their songs that they let go off find their way back to them in ways they could have never imagined. When a woman approached them after a pre-show set and shared with them how the song "Scarlet" had helped her get out of a life of prostitution and despair, they were truly humbled. With such an incredible story, it was difficult not to listen to the succeeding acoustic performance of "Scarlet" and not be affected by the lyrics. Haseltine then talked briefly again about writing love songs and how they tend to be a bit more realistic than idealistic with their writings (which doesn't always impress the guys' spouses), and reflected on the awkward memories of his junior high dance (complete with a brief joke song about the experience). The more upbeat "Mirrors & Smoke" followed, and then the guys reminisced about penning the next song on a bright, sunny day underneath a tree, before playing their mega hit, "Flood." 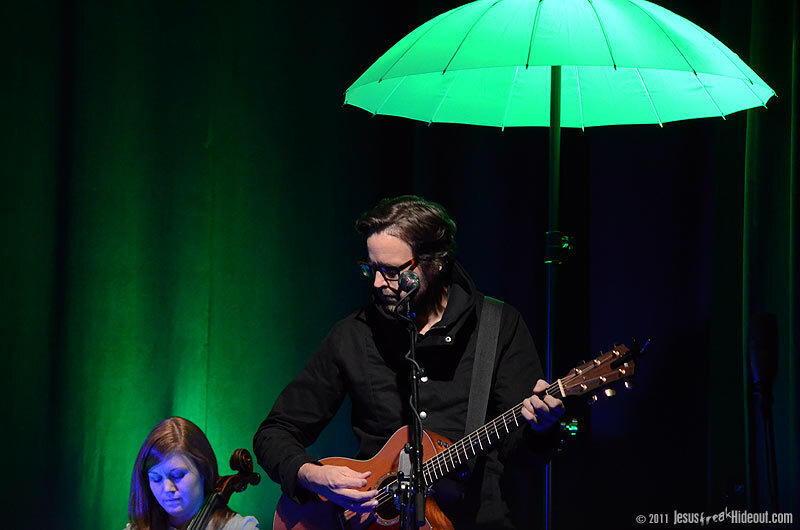 "Dead Man (Carry Me)" was next, and then Haseltine introduced the last song as being one of his favorites that they'd never played live before this tour, and launched into "Water Under The Bridge," from Good Monsters, complete with ukulele and melodica accompaniment. 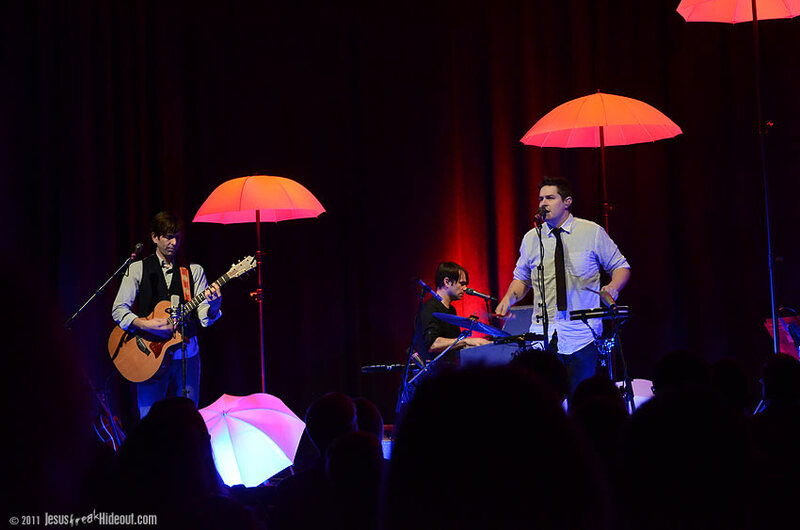 Jars of Clay waved goodbye and exited the stage, leaving the Sellersville Theater patrons on their feet and cheering for more. Before long, the guys emerged once again with plenty more music to play. 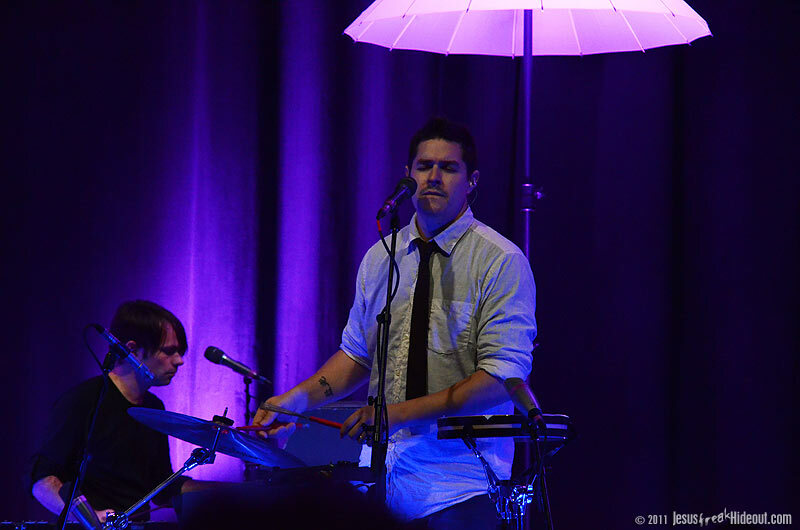 With Haseltine providing an electronic beat on a synthesizer of sorts, he created some unique sounds to accent a wonderful rendition of "Frail," the title track from their debut independent release, which later was re-recorded (with verses) for Much Afraid. 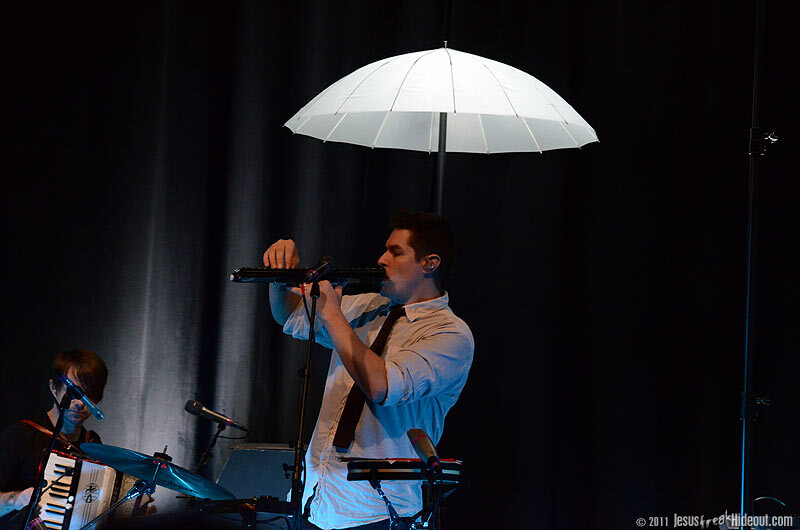 "Weapons," from Long Fall, was next, and Haseltine continued to use the electronic pad to provide a beat and additional musical textures. Afterwards, they played their version of "All My Tears," which especially sounds great done acoustic, and it was with this song that I assumed the set would wrap up. To my surprise, they stayed on stage and prepped to perform more. Dan talked briefly about Blood:Water Mission (www.bloodwatermission.com) and encouraged the audience to donate even just a dollar, which would provide one African with clean water for an entire year. A fan shouted out the song title "The Valley Song" and the guys joked whether or not Dan still had the lyrics in his memory banks, but the singer soon promised they would play it after the next song, the title track from The Shelter, and then made good on the promise by fulfilling the request. 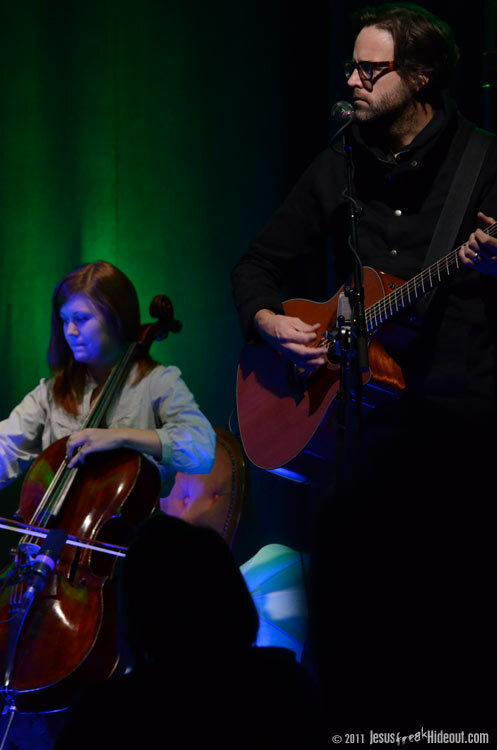 It was a powerful addition to the set list, and when Emily returned to the stage one last time to aid the band in playing the closer, "Worlds Apart," it was quite a sweet way to bring the afternoon's music to a close. The guys then waved goodbye and left the stage again. What was especially unique about this date in Sellersville was that the Jars guys were not only playing a 3:00 and a 7:30 show in the same day at the Sellersville Theater, but they were recording the 7:30 show for a DVD to be produced this fall. The camera crew took some test footage during the opening songs of Jars' earlier set but then returned to film the later set for the DVD release. If that's the case, we can probably bet the set list will be almost exactly what everyone had seen at 3pm, and it'll be one wonderful project to grab when it releases in the coming months. If the Sing & Tell Tour comes your way next spring, be sure not to miss a really memorable evening of great music.